A serious crash involving a Land Rover and a minibus forced police to close the M55 for three hours last night (Sunday, April 7). One person was taken to hospital with an arm injury after the collision on the M55 eastbound at 10.26pm. The M55 was shut between Preston and Kirkham from 11pm on Sunday, April 7 after a Land Rover collided with a minibus. Police closed the carriageway for more than three hours, between junction 3 (Kirkham, Fleetwood A585) and junction 1 (Preston, Broughton A6), from 11pm to 1.30pm. Highways England described the incident as a "serious collision" and a number of emergency response vehicles attended the scene. One casualty was taken by ambulance to Preston Royal Hospital with an arm injury and a number of "walking wounded" were treated at the scene. A diversion was put in place advising trapped traffic to exit the M55 at J3 before taking the A585 south towards Kirkham. A police spokesman said: "It was a minor collision involving a Land Rover and a minibus. The road was closed for about three hours." 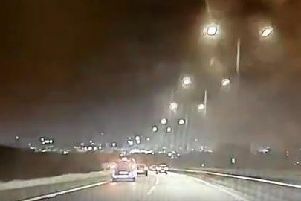 The carriageway was cleared and all lanes reopened at around 1.30am (Monday, April 8).